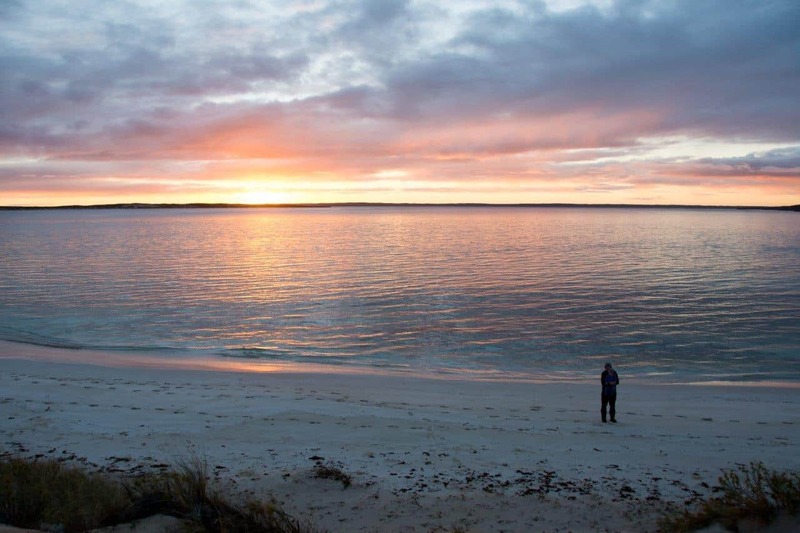 Asides from being an incredible adventure and the most western point of Australian mainland, Steep Point is very well known for its fishing. 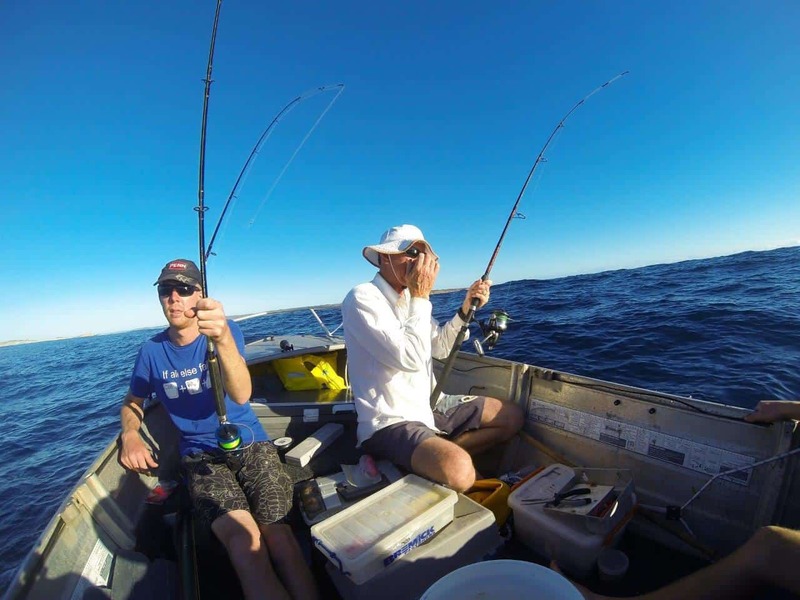 So much so that it’s often referred to as the best land based fishing in Australia. 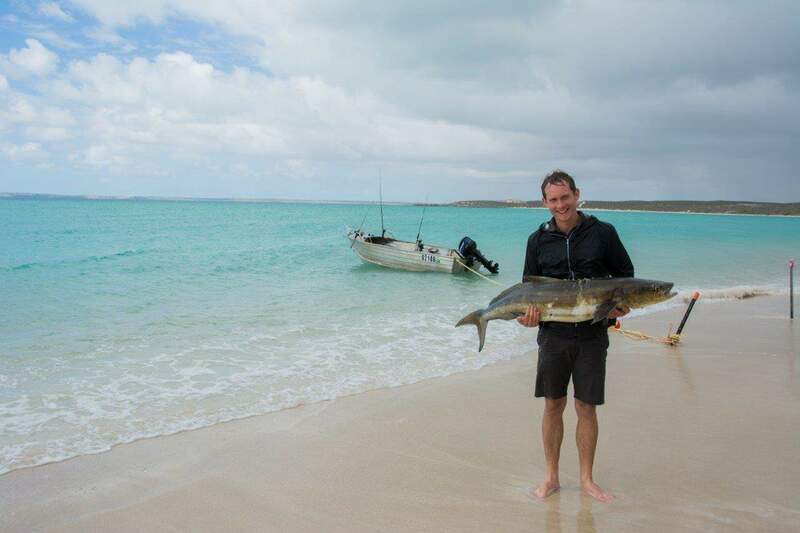 In July of this year we spent 9 nights camped at Shelter Bay, lapping up the turquoise water, isolation and unbelievable fishing. We started off taking it a bit easier than we probably should have, and took a while to find some decent places to fish and dive. We’d been to Steep Point once for the day from Carrarang Station and cleaned up just near Monkey rock when spearfishing and cray diving, but the current was not in our favour over these 9 days; it was almost impossible to swim against and we gave up very quickly. We towed two boats out to Steep Point. One was my 3.75m tinny that’s been decked out for rough, offroad work. 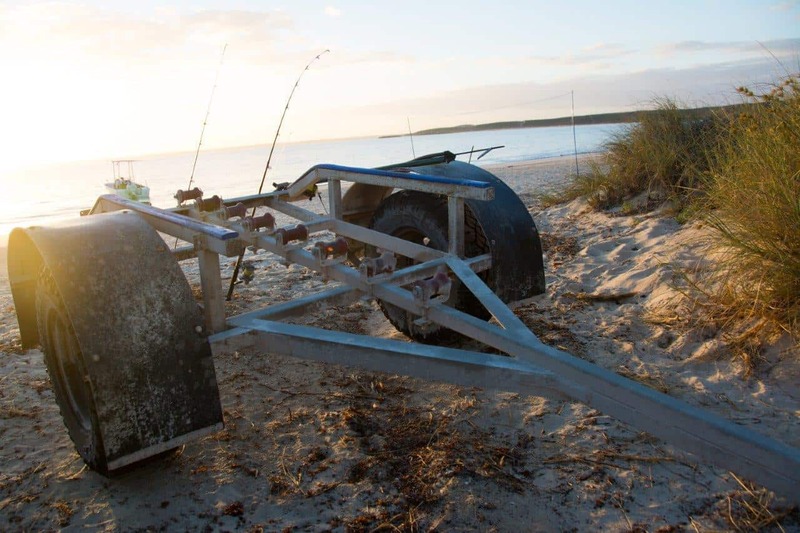 You can read more about that here – 4WD boat trailer build. The second boat was a fibreglass 5 metre boat running a 115hp 2 stroke on the back. The trailer was strengthened substantially in the months leading up, and we took it pretty carefully on the way in. Asides from the leafs moving sideways, it performed without any issues. We had it pretty good while we were there. As you’d imagine, a 3.75 tinny with fishing gear and 3 or 4 guys makes for interesting times if its rough. In the bay it did get quite choppy for a few days, but it was still ok if you were prepared to get wet. Heading out of the bay though (out west), was a different story. The ground rises up from 25 metres to about 7 over a tiny section, and when the current is running the wrong way you end up with a whole heap of churned up water that would easily sink a boat if you turned the wrong way. Luckily, this was only the case on a few occasions and asides from steering clear of where the waves were breaking it was happy days. We only headed out past Steep Point in the boat once, when conditions were very flat, albeit a big swell. Motoring up and down swell that is 4 – 6 metres tall is like driving up and down sand dunes. We were very cautious coming back in, as the waves seemed to break all over the place. I kept a keen eye on the back of the boat, and was ready to swing it around into any waves coming our way, but we never had any issues. We talked to a few people about diving at Steep Point, and got many replies along the line of ‘You are mad, its shark central up there’. Mainly these come from the guys who fish up there and haven’t done much diving. We’d dived before at Monkey Rock (which is supposed to be big shark country) and never had an issue, and knowing we all wear shark shields and keep an eye on each other we were relatively comfortable with getting in the water. If you find good ground, you’ll get great fish very easily. An hour in the water always outperforms hours fishing above it! Our usual spot at Monkey Rock was almost impossible to dive as the current was raging through most of the time, and when it wasn’t the waves were too big. We did well further in the bay though, at rocky areas spread all over the place. 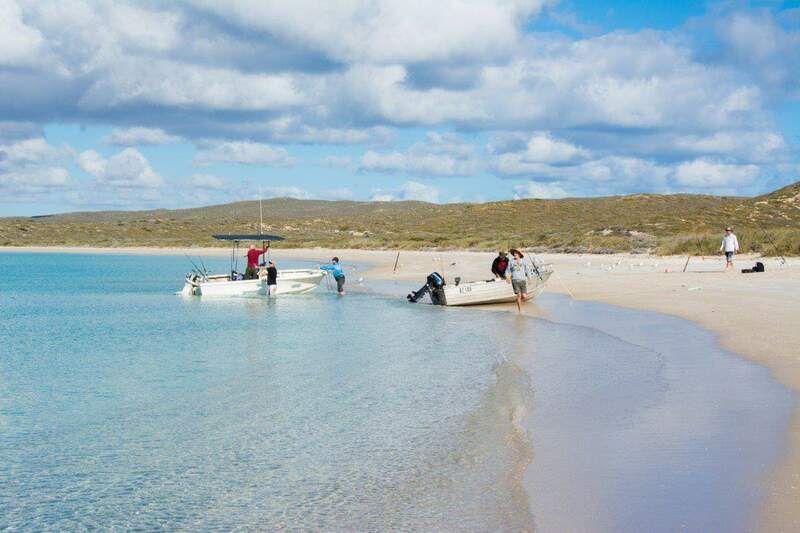 We did a bit of fishing from the beach, but it hardly seemed worth it with the boats there. A few tailor, lots of long toms and other odds and ends were caught. We did see some schools of big fish swim by, and a number of sharks called in. Guaranteed if you chuck a bait out after dark and sit and wait something will take it. Often its a shark, but still good fun. 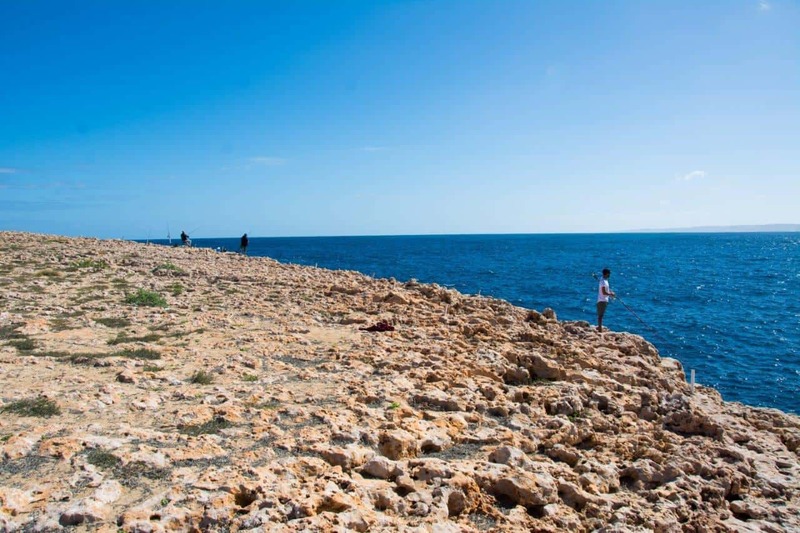 Cliff fishing is probably the main way its done at Steep Point. If you head out to the western most point and down to the Oven, everyone fishes off the rocks. It’s around 6 – 12 metres off the rocks depending on where you are. Ballooning is extremely popular with the right winds, or flicking lures around seems to be the other way people go about it. You need a cliff gaff, and you will loose gear to sharks and reef. Having a long leeder is very important when fishing off the cliffs, as it will get smashed around near the rocks at the bottom of the cliff. 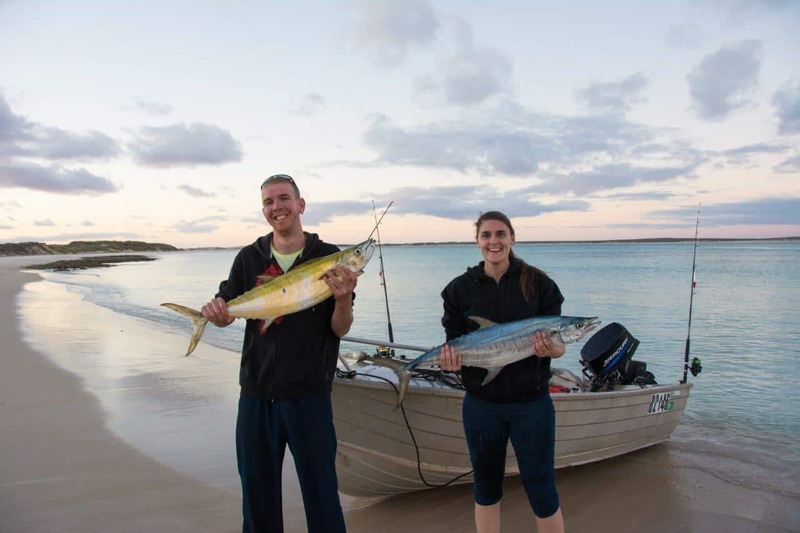 You get massive fish off the cliffs – Tuna, Mackerel, Spangled Emperor, Wahoo, Sail Fish and a huge variety of other fish. It’s hard work, and you want to be very careful on the rocks, but the pay off is huge. People have fallen over the edge and died in the past, so tie yourself on, wear a life jacket and take it easy! Again, we didn’t do much fishing from the cliffs as it was much easier just to drive the boats 15 minutes out from camp and fish the same spot, right next to the boat! Our most reliable way to catch fish was trolling. You could troll up and down the bay and guarantee to catch something. Some times it would take an hour, and other times you’d get something every 5 minutes. The fish like channels and drop offs, and we found several areas that performed well. Most of the catch were Mackerel (we threw the shark mackerel back, or used them as bait) with the occasional reef fish and a massive Cobia. Look for birds diving, and you’ll soon see the fish jumping; we regularly saw hundreds of tuna and mackeral jumping out of the water, and would head towards them. If you get bored of trolling just stop and flick lures their way; you’ll have a ball. 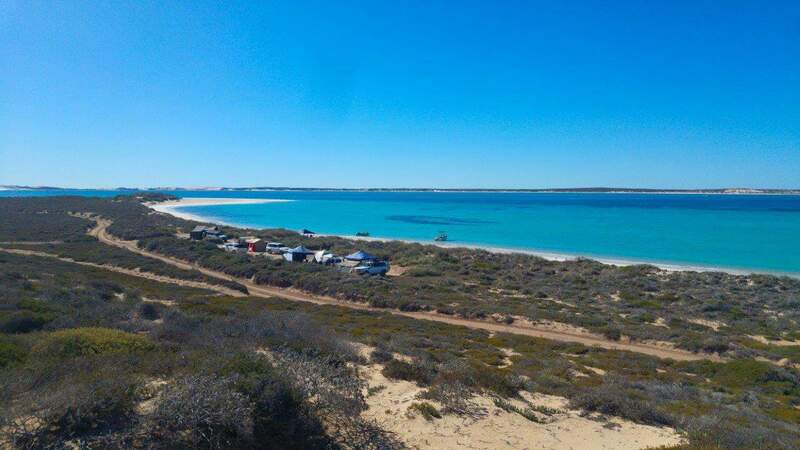 Steep Point is in Shark Bay World Heritage Area. There are a LOT of sharks. You will lose a lot of fish to sharks up there; its just the way it is. They aren’t aggressive, but they are around and in huge numbers. 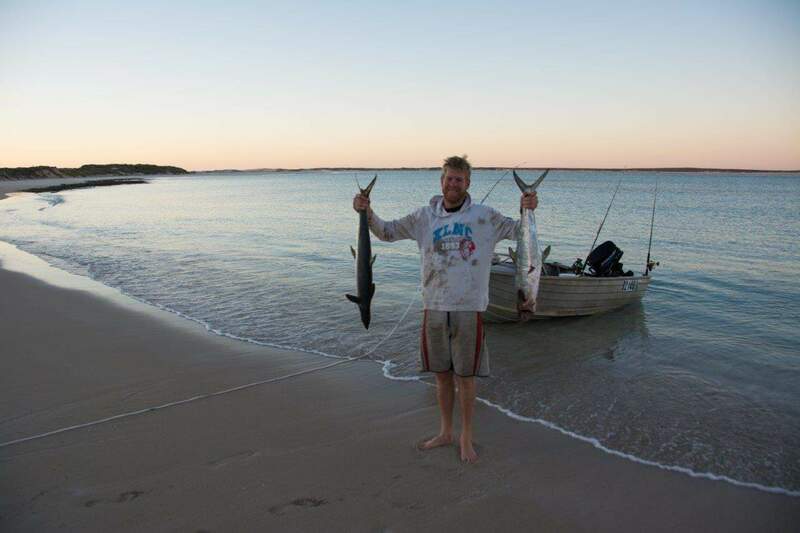 We would head out from camp at Shelter Bay a few hundred metres and stop to rig lines up for trolling, and within a minute there would be at least 3 sharks at the boat. I guess they are used to getting a feed from the boats. 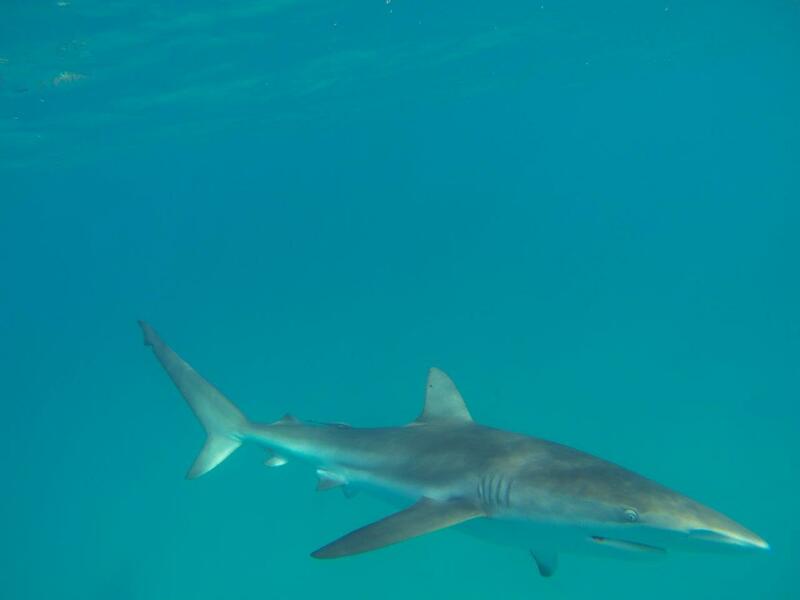 These sharks are anywhere from 2 metres to just under 4, and when you are sitting in a little tinny its rather entertaining. I watched their behaviour quite closely, and they were almost always calm and relaxed. Occasionally they would get a bit rowdy if you were throwing frames over and there were a lot around, but they weren’t interested in doing any damage. 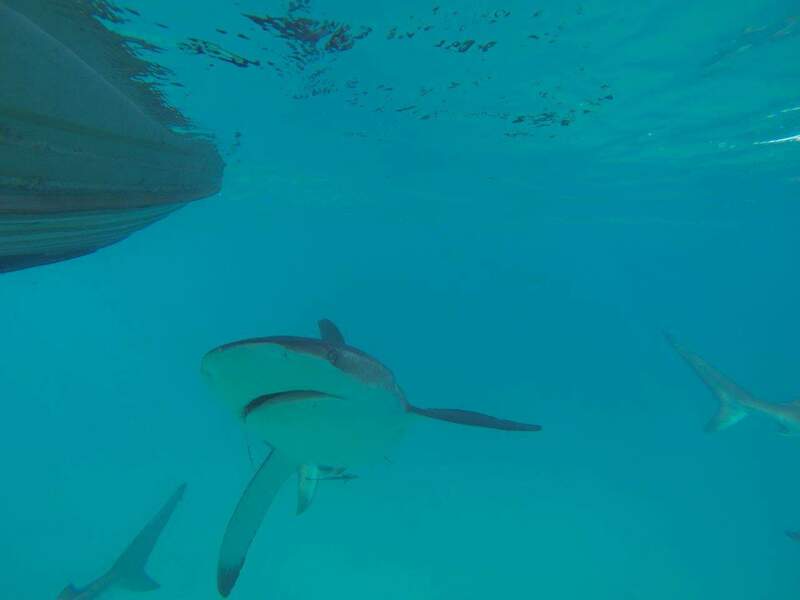 A number of times I had my camera in the water and sharks came right up to it, knocked it a bit and swam off. We put the shark shield in the water a few times with the sharks near us, and within a few seconds they’d all disappear, so that’s a good thing! 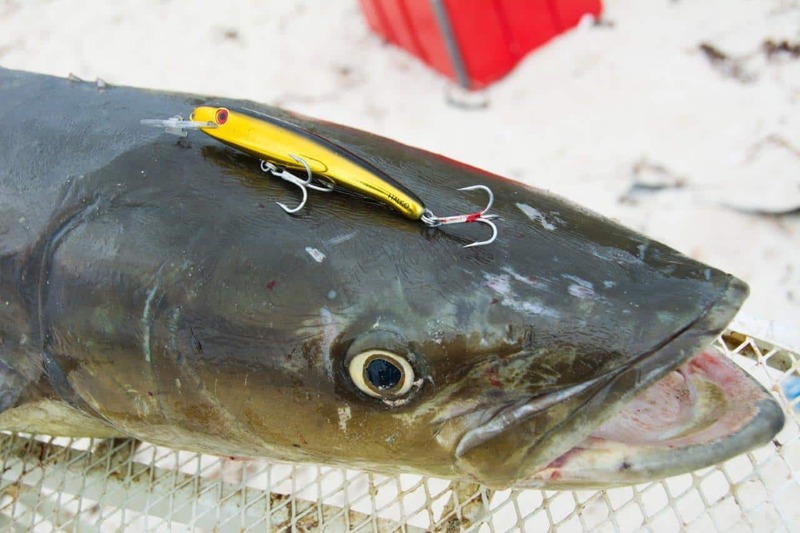 There were two stand out lures for us – a 120mm long gold and black Halco and any of the Rapalla Red and White lures (the shiny ones worked best). We tried a heap of other gear, and never got much, if anything at all. There is one sanctuary zone that you need to be aware of at Steep Point; Surf point. This is located on the south western corner of Dirk Hartog island, and covers a fair bit of area. You can’t do anything in the sanctuary zone except look. I only realised after booking the holiday that we had done it outside of Cray season, which I was pretty annoyed about. It runs from 15th of October to the 30th of June each year. There are plenty of crays up there in season. Unfortunately, we had to leave them alone. 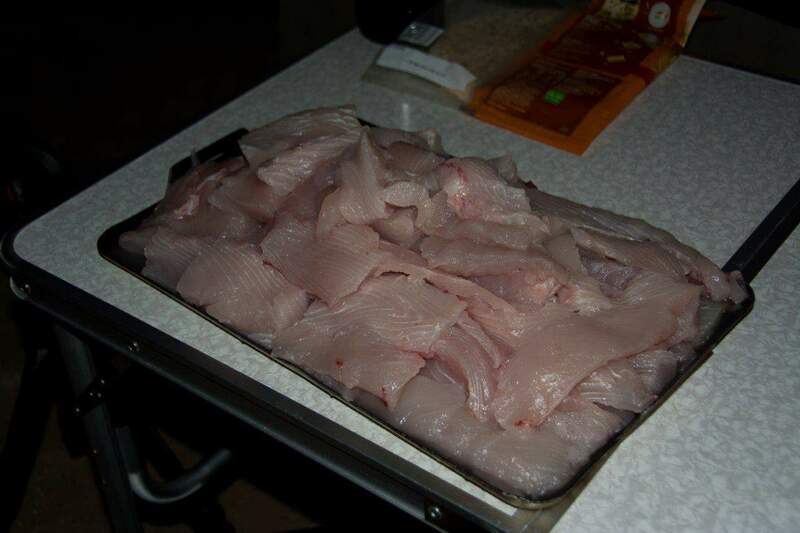 At the time of writing, you are allowed to bring 20kg of fish fillets home per person. We stored ours in 12V freezers powered by battery systems and solar panels. We probably took about 60kg of fillets home between 10 people. Not nearly as much as we thought we might get, but enough for several good feeds. It’s all gone now; we need to go fishing again! 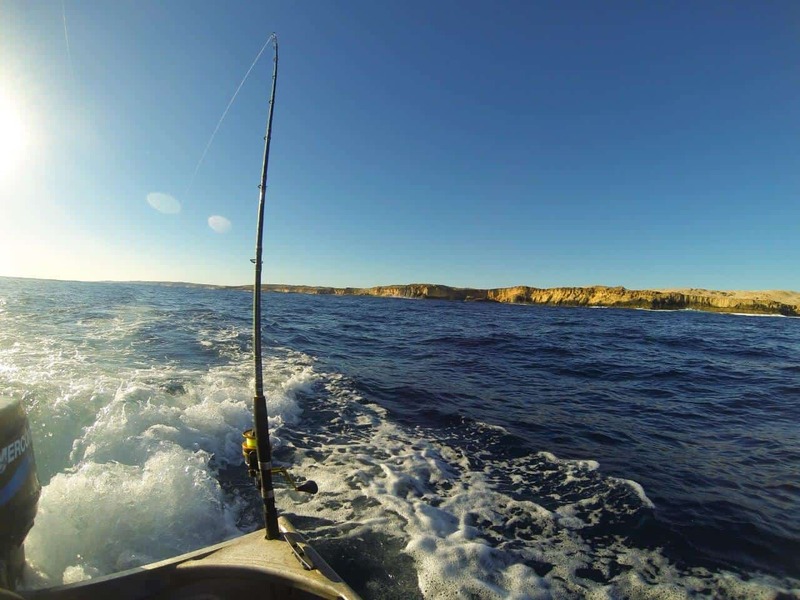 Have you fished at Steep Point? What did you think? Any tips?